Removing make-up is basis of looking fresh and the most important skincare for a radiant skin in the long-term base. This week (and upcoming weeks too) was so busy, I fell asleep with make-up twice and didn't pay much attention to my skincare routine. My skin was craving some care, it felt dry and looked less healthy. All that from just two days of falling asleep with make-up. The packaging looks very similar to my beloved Caudalie Grape Water, because it's from the same line based around grapes. The formula is 100% natural: no silicones, mineral oils or preservatives. It contains sunflower oil, castor oil, almond oil (nourishes, hydrates, calms the skin) and of course the iconic Caudalie grape seed oil (regenerative and contains linoleic acid and omega-6). These ingredients are all great for the skin and suitable for all skin types. It even can be used on lip and eye contours. You need three pumps cleansing oil to wash off your make-up. Just warm the oil in your hands first and when it's warm, massage it in. When you add water, the oil turns into a milky white, watery substance and it's easy to rinse off. 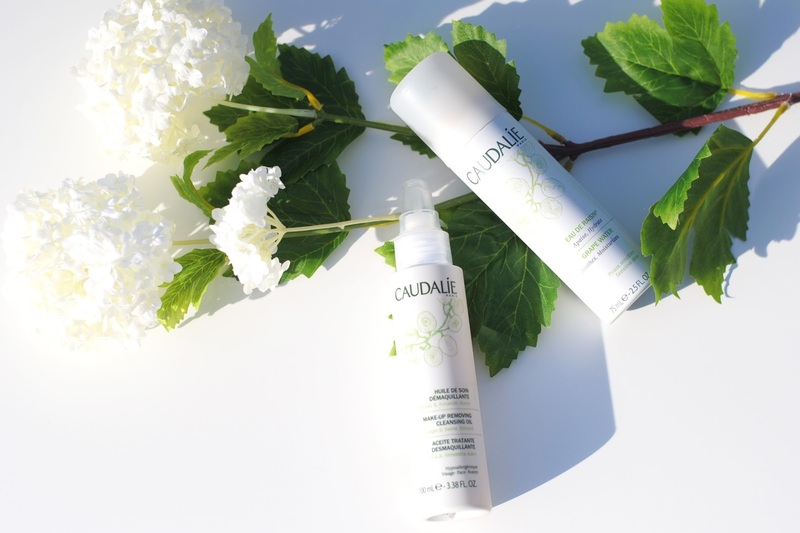 The Caudalie cleansing oil is good in what it does, but I never was the biggest fan of oils. Not for my hair, face, legs,... I prefer creams or in this case micellar water. However I do use it to rinse off swatches because it's so easy and quick. Oh, and it smells like almonds, hmm. Have you ever tried a make-up remover/cleansing oil? The packaging of the Caudalie products always look great! So this one as well, and it's great that it's 100% natural! I will absolutely try this one too! Where can I buy it? Oh ik heb de cleansing oil ook.Zo'n heerlijke geur! Ik heb ‘m ook. Ruikt goed en ik vind dat hij ook goed werkt. Gewoonlijk ben ik bang dat olie zo’n vettig laagje achter laat maar dat heeft deze niet echt vind ik ! Pluspunt! I love the Caudalie Grape Water from b-glowing! Definitely trying out the cleansing oil soon as well.